We all know that The Walking Dead star Norman Reedus is an interesting guy, for reasons that usually have to do with something weird and awesome. So it should make sense to everyone reading this that Reedus’ favorite day on the set of the hit AMC zombie drama involved Daryl dealing with disgusting gore and a slightly depressing mission. Oh, that Norman. When asked about what his favorite experience on the set was, Reedus didn’t bring up riding his motorcycle or bringing his crossbow up to blast some walkers. He goes all the way back to the Season 2 premiere “What Lies Ahead,” in which Carol’s daughter Sophia first goes missing. Here's what he told EW. 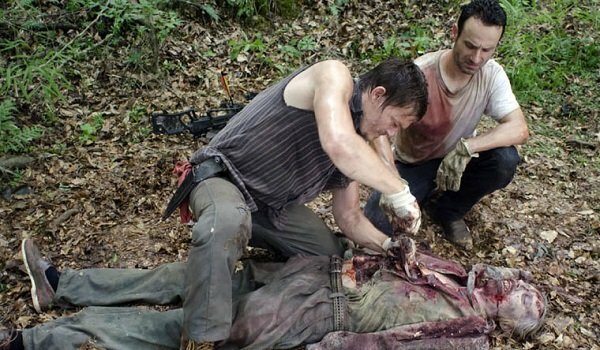 I gotta say, Andy [Lincoln] and I with Greg [Nicotero] and the special effects team cutting open the zombie body trying to look for Sophia’s bones. Because that was just a really fun, funny day. I really like that one. That was probably my favorite because there was like FLOOP! noises and hot air in the woods. That was kind of awesome, I have to admit. There have been so many favorite days for me on the show though. That one sort of sticks in my mind this morning because that was really funny. I have to say that at no point in my life did I expect to hear anyone say that digging through a dead creature’s guts to find the bones of a missing child would be the “best” part of anything. It’s good this show is fictional, although I can’t say with certainty that Reedus doesn’t get into some insane scavenger hunts in his free time. Here’s a shot from that scene to remind you how it went. To be fair, it’s almost always when laughter is the most unexpected reaction that laughter becomes the most unstoppable force. I’ve shamefully had multiple occasions where I broke into spontaneous bouts of the giggles while at a funeral, despite nothing funny happening at the time. I can imagine those situations would have been spiced up by some hot air and floop noises. We’d love to see Daryl getting into some more unforgettable scenes in Season 6 and beyond, although we’re perfectly fine if none of them have anything to do with finding any missing girls. He’s done that a lot already. Reedus fans should be happy to know that he’s got his own reality show coming in which he and a guest will ride around the country on motorcycles. Here’s hoping he can get Andrew Lincoln and Greg Nicotero on there, and that they go around the locations for The Walking Dead, and there’s a certain walker laying on the ground just waiting to be ripped open.